Bread. Crusty, crunchy, aromatic, delicious bread. It’s another baked good that will perfume your house for a whole day. Bread can be tricky, and not always user friendly to make. How do I make great bread? How do I get that great crust on the outside and still have a soft, elastic, and chewy center? What’s the trick? It takes a little practice, but if you follow my steps, you will be on your well to exceptionally good bread. It’s addictive, and if you like it, you will find that changing and modifying little things will make a big difference in making the bread your own. This is wonderful, creative bread recipe, that incorporates an enormous amount of technique, that, when broken down step by step, will enable you to make many different types of bread. The steps are not hard at all, and once you get the feel of it, you’ll find it to be easy. Good bread is a complex thing. Anyone can make average bread, but to develop that deep flavor, crunchy crust and soft elastic glutens takes a little practice. Deep flavor: This is a product of fermentation, and the best way to do this is through the use of a pre-ferment (or starter dough) and letting the bread slowly rise, several times, before baking. A pre-ferment is like a basic bread dough that is made the day before the actual dough. Crunchy crust: This is the easy part. 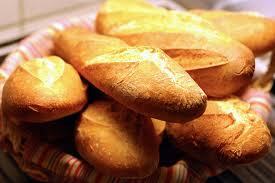 Make sure the oven is HOT, and make sure you have some sort of moisture on the bread prior to baking. Spraying the bread with a little water or using an egg wash are two techniques for accomplishing this. And, of course, do not open the open excessively while the bread is baking. Don’t let the heat escape. Elastic gluten (soft and chewy inside). This is the tough part. Initially working the dough until elastic is critical, as well as turning the dough several times before baking. This is similar to punching the dough, except that instead of outright deflating the dough, you will fold it several times, reworking it and letting the dough gently reform its glutens. This recipe produces wonderful rolls stuffed with a sweet and tangy compound butter, but the dough itself is a lean dough, and can be shaped into baquettes, boules, French loafs, and so on. Mix all ingredients in a small mixing bowl, cover tightly, and let sit at room temperature over night. Reduce the orange juice to a syrup. Let cool to room temp. Mix all ingredients in a stand mixer with paddle attachment, until well incorporated. Place butter on plastic wrap, roll into a log, about 1/2 in in diameter (youtube for lessons on this) and refrigerate until rock hard and set. Unwrap the logs and cut into pieces 3/4 inch in length. Refrigerate and reserve until ready for use. You will need a stand mixer fitted with the dough hook. In the bowl, add the flour, water, yeast, sugar and pre-ferment. Turn the machine on low and work until barely mixed. Turn machine off, wrap bowl with plastic wrap and let sit for 1/2 hour at room temp. This allows the flour to absorb the water (salt will hinder this process and may kill the yeast, so it’s added later) Add the salt, turn the machine on medium fast and work until glutens have formed (dough is pulling off the sides and has become stretchy and elastic). If it is too dry, add water, 1 tbsp at a time (ambient humidity can affect this). If too wet, add flour, 1 tbsp at a time. Turn dough out into a lightly greased mixing bowl, cover tightly and let double in size in a moderately warm place. This will probably take 1 to 1 1/2 hours. ‘Turn the dough’ . To turn the dough, place it on a lightly floured work surface, and fold it in half twice, always keeping the same side exposed to the air. After turning, place the dough back in the mixing bowl and cover. Turning the dough does two things: slightly deflates the dough, works the dough creating better glutens, and allows more time for the dough to ferment, or develop, creating better flavor. Turn the dough 3 times in total, once every half an hour. Heat your oven to 450. After the last turn, portion the dough into 4 oz pieces. Working one at a time, flatten dough into rectangle shape. Place one piece of the compound butter in the center, roll in the dough and tuck in all sides. Pinch to close and lightly roll dough on the work surface to round-out. When all the rolls are ready, paint the egg wash on all exposed sides with a pastry brush. Cover lightly and proof bread in a warm place. You will know it’s ready when the rolls are almost doubled in size and will take a dent. Taking a dent means that when lightly poked, the dent will remain. Place in oven and bake until deep golden brown and cooked through. Let cool completely on a wire rack. This allows the steam to be re-absorbed by the bread, keeping it moist and developing the correct finishing texture. Rewarm slightly before serving.